Holidays in Pyrgos help you immerse yourself in the quieter side of beautiful Santorini. Located on the volcanic crater, it offers striking views of the sparkling sea and rolling green countryside below. Its winding streets are home to small white houses, galleries, and vineyards, typical of the island. Perfect for picking up souvenirs and other gifts. The town’s inland location means you can explore farmland and green landscapes by foot or bike. The town is awash in history and there are many old churches to see, the 10th-century Church of Theotokaki is home to beautiful frescoes, which you can view inside. If you want the best views of Santorini, spend your time in Pyrgos. 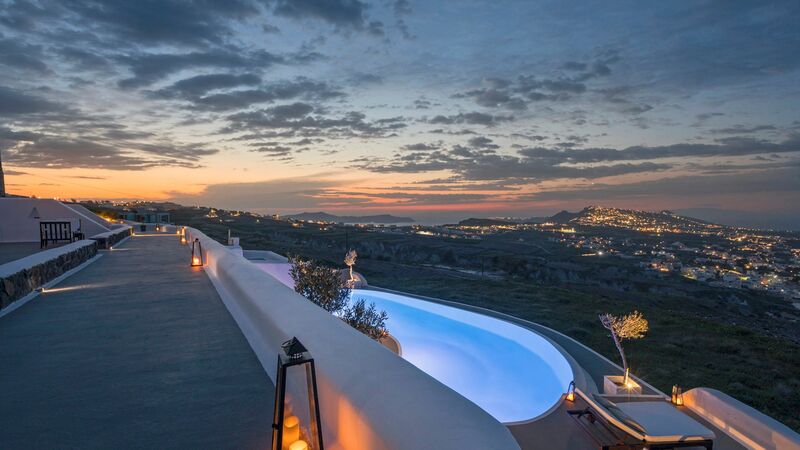 Situated at the highest point of Santorini you’ll have panoramic views of the entire island. On its hilltop you’ll find the ruins of the castle of Pyrgos (c. 1580) – one of only five Kastelias (Venetian castles) on the island. Although Pyrgos doesn’t have a beach as it’s an inland village, Kamari and Perissa beaches are only a 15-minute drive away. Both beaches have been awarded Blue Flag status, and you’ll be spoilt for choice for places to eat if you wanted to lunch at one of the beach-front restaurants, or bars. Fira the capital, is also a 15-minute drive away – there you can wander among other historical landmarks, such as the grand Orthodox cathedral, but also treat yourself in one on the many shops, bars, and restaurants. There are some fantastic upmarket hotels to choose from for your luxury holiday in Pyrgos. Book with Sovereign and you can relax, knowing everything is taken care of. We’ve tried and tested each of our carefully selected hotels to ensure it offers the best rate facilities and service, as well as matching our exacting standards. Stay at the Carpe Diem Exclusive Boutique Resort for an infinity pool with stunning views, and bright and elegant guest rooms. There is also a rooftop fine dining restaurant, a spa, and personalised boutique service, with just 10 suites available at this adults’ only hotel. Transfer time from Santorini airport to Pyrgos is approximately 15 minutes.